Born and raised in the Bronx and recruited to play football at Mississippi State, Morris Cohen fought for the Loyalists in the Spanish Civil War and with the U.S. Army in World War II. He and his wife, Lona, were as American as football and fried chicken, but for one detail: they'd spent their entire adult lives stealing American military secrets for the Soviet Union. And not just any military secrets, but a complete working plan of the first atomic bomb, smuggled direct from Los Alamos to their Soviet handler in New York. Their associates Julius and Ethel Rosenberg, who accomplished far less, had just been arrested, and the prosecutor wanted the death penalty. Did the Cohens wish to face the same fate? Federal agents were in the neighborhood, knocking on doors, getting close. So get out. Take nothing. Tell no one. 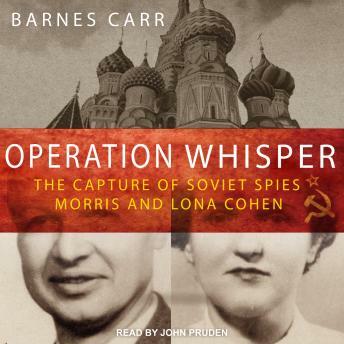 In Operation Whisper, Barnes Carr tells the true story of the most effective Soviet spy couple in America, a pair who vanished under the FBI's nose only to turn up posing as rare book dealers in London, where they continued their atomic spying. The Cohens were talented, dedicated, worldly spies-an urbane, jet-set couple loyal to their service and their friends. Most people they met seemed to think they represented the best of America. The Soviets certainly thought so.